Phison has been sampling its entry-level PS5008-E8 NVMe SSD controller for well over a year now, and a number of its partners have demonstrated their drives featuring the chip, but no one has started to ship actual products thus far. As it appears, things are about to change as Lite-On has quietly added its new entry-level MU X PCIe 3.0 x2 SSDs based on Phison's controller to its lineup and promises to start selling them shortly. Interestingly, Lite-On will sell the MU X products in retail, which does not happen often with the brand. 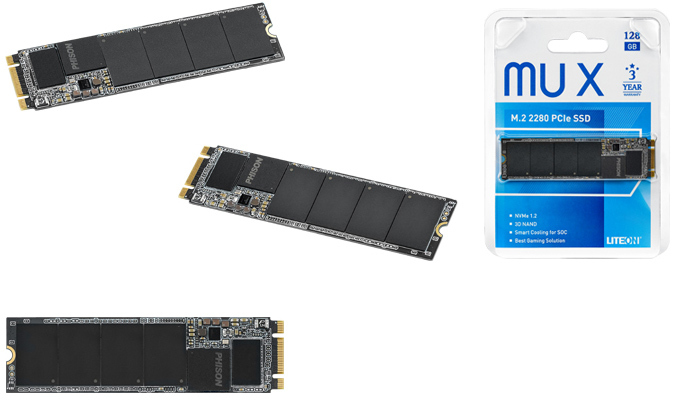 Lite-On’s MU X M.2-2280 SSDs will be available in 128 GB and 256 GB configurations targeting inexpensive gaming PCs that need something faster than conventional SATA SSDs, but cannot afford more advanced PCIe 3.0 x4 drives. The Phison PS5008-E8 controller will work with Toshiba’s 256 Gb BiCS3 3D TLC NAND memory, which is gaining traction among SSD makers these days. Phison yet has to disclose all the details about its PS5008-E8, but what we do know is that the controller is compliant with the NVMe 1.2 specification, uses a PCIe 3.0 x2 interface, features four NAND channels, a DDR3/DDR3L DRAM buffer, Phison’s proprietary error correction algorithm called StrongECC, the company’s own RAID ECC algorithm to recover user data from uncorrectable errors, AES-256 encryption, and so on. The key selling point of the PS5008-E8 is not extreme performance, but affordability and reliability. Indeed, the Lite-On MUX 256 GB offers up to 1600 MB/s sequential read speed as well as up to 850 MB/s sequential write speed (with pSLC enabled), which does not seem like a record-breaking performance, but which is in line with contemporary entry-level PCIe 3.0 x4 SSDs. When it comes to random performance, the MUX 256 GB is capable of 140K/145K random read/write IOPS, which is ahead of many PCIe 3.0 x4 drives. As for the 128 GB model, its write speed is speced at up to 1500 MB/s, but its read speed is 450 MB/s, which is comparable with modern SATA SSDs. As for reliability, Lite-On rates its MU X drives for 1.5 million hours MTBF and covers them with a three-year warranty. Lite-On produces most of its drives for various PC and server OEMs, to address consumer markets, the company uses the Plextor brand. OEM orientation of Lite-On’s SSD business is a primary reason why the company uses SSD controllers from multiple developers (including Marvell, Silicon Motion, and Phison) — different clients have different requirements when it comes to performance and pricing. Some of Lite-On’s drives use in-house design, other are based on reference designs from respective developers of controllers. When it comes to the MU X, the drive uses a design developed by Phison, which has passed Lite-On’s quality checks. Lite-On’s MU X drives will hit store shelves in the coming weeks. MSRPs of the drives are currently unknown, but since affordability is a key feature of the controller, expect the actual SSDs to be priced accordingly. As for the 128 GB model, its write speed is speced at up to 1500 MB/s, but its read speed is 450 MB/s, which is comparable with modern SATA SSDs.